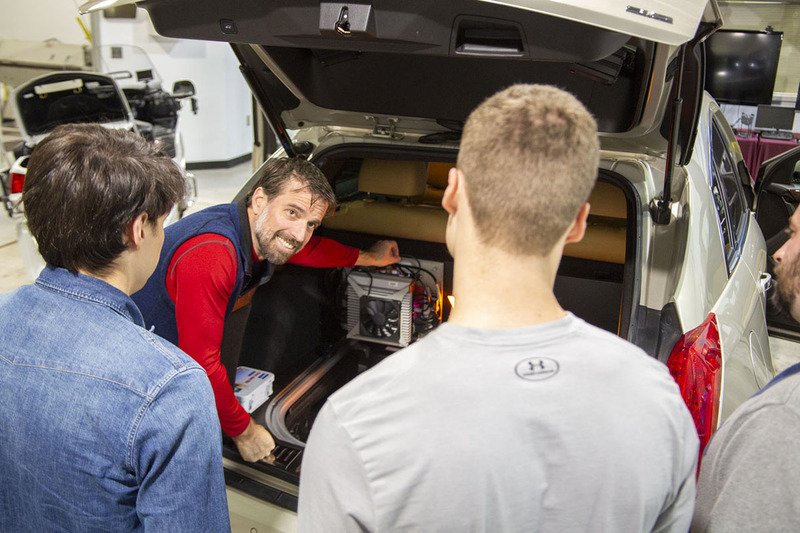 Automotive industry leaders now have the rare opportunity to help train the next generation of connected- and automated-vehicle engineers thanks to InternHUB, a unique paid internship program at the Virginia Tech Transportation Institute (VTTI). “We are excited and pleased to provide our partners with state-of-the-art resources and access to the talented students of Virginia Tech, which consistently ranks among the top ten engineering schools in the nation. Our unique program aims to transform students into transportation professionals and provide our participating industry members with a sustained pipeline of talent to meet their workforce needs,” said Zachary Doerzaph, director of the Center for Advanced Automotive Research at VTTI and leader of InternHUB. Doerzaph is also an associate professor in the Department of Biomedical Engineering and Mechanics at Virginia Tech. InternHUB invites automotive suppliers and manufacturers to hire talented Virginia Tech undergraduate and graduate student interns to help develop next-generation transportation technologies alongside VTTI faculty. The goal is to facilitate practical skill development for interns and workforce-ready talent for employers, as well as to encourage continuous, meaningful relationships between interns and their sponsoring companies. Unlike traditional internships, InternHUB may last up to three academic years, providing ample time for students to become acquainted with industry projects and foster the skills needed in today and tomorrow’s transportation workforce. Technology company Continental is currently participating in a soft launch of InternHUB. Three student interns travelled to Michigan over the summer to shadow Continental engineers and observe how automated-vehicle systems and their advanced sensing, controls, and interfaces are developed. This fall, the students are back in Blacksburg and continuing their internships at the transportation institute. Gregory Beale, a master’s student in engineering mechanics, mentored under a Continental engineer who was developing a driving algorithm for the company’s autonomous shuttle project, the CUbE (Continental Urban Mobility Experience). This semester, Beale is working with VTTI faculty on designing a small-scale model vehicle prototype that will test new automated driving solutions. “Continental is interested in developing an autonomous rapid prototype platform that operates in a safe, scaled-down environment. At VTTI, we are in the process of developing and testing this scaled prototype and identifying specific traffic scenarios to improve maneuver-planning algorithms—and we can do that by pulling from the millions of miles of naturalistic driving data that VTTI has conducted over the years,” explained Beale. The idea of the project is to observe how the vehicle prototype could operate in complex real-life driving scenarios, such as a bicyclist crossing the street, when given certain sensory information. “This is a great opportunity for students to work together with our team in a hands-on, agile development environment and expose them to advanced technology while enforcing the safe and systematic engineering practices that we expect here at Continental,” said Jeremy McClain, Director of Systems & Technology at Continental North America. Beale noted that project details are proprietary, which in and of itself has been a valuable experience for navigating the competitive automotive industry. “As a student, I have really appreciated the chance to work on proprietary research. Being able to collaborate with engineers in the field who are actually developing automated vehicles is an incredible opportunity that I would not have had otherwise,” said Beale. InternHUB is housed within VTTI’s Automation Hub, an interdisciplinary advanced learning facility that opened on Nov. 27 during a ceremony attended by the transportation institute’s industry and government partners, as well as university officials. Located on the Virginia Smart Roads test bed in Blacksburg, Automation Hub includes over 15,000 square feet of shared garage and shop facilities used for vehicle instrumentation, as well as for mechanical and electrical system development. According to Doerzaph, Automation Hub is designed to facilitate fast-paced, high-tech transdisciplinary projects. For partners, the Hub’s flexible organizational structure ensures faster results and the ability to collaborate continuously with researchers and students throughout the project development process. “The automotive industry is rapidly evolving as the philosophies of traditional automotive industry mix with those of tech companies from Silicon Valley and beyond. InternHUB adopts this emerging trend by creating an environment modeled after tech startups. Our students work in small teams guided by experienced faculty mentors and follow Agile development processes. A large open-concept design studio encourages broad collaboration amongst team members and is only a short walk down the hallway to a full complement of garage and shop facilities. Through these state-of-the-art capabilities, we are able to provide all the necessary tools for development and testing of advanced vehicle technologies and to ensure impactful project outcomes for our customers,” Doerzaph explained. InternHUB projects will also benefit from VTTI’s full suite of research and support resources, including the Virginia Smart Roads, instrumented research vehicles, hardware and software development groups, extensive naturalistic driving databases, and a high-performance computing center. Beale, who will continue his internship through the summer of 2020, believes the skills he is learning will help him achieve his goal of becoming an automotive engineer. “I want to go into industry someday and hopefully work on automated-vehicle testing and development, so this has been a great opportunity for me. At first I was not sure whether I wanted to pursue an internship this summer, but I am very glad that I did. Really, there is no better time than now to get this kind of experience,” said Beale. The transportation institute is actively seeking additional partners to join the program, as well as student interns for the winter of 2019. Visit the InternHUB website to learn more. Companies seeking more information on becoming an industry member may contact Zac Doerzaph at zdoerzaph@vtti.vt.edu. Students interested in applying for InternHUB should contact Melissa Hulse at mhulse@vtti.vt.edu or 540-231-0366.